These delicious Simple chicken fajitas are just the dinner recipe your family ordered! 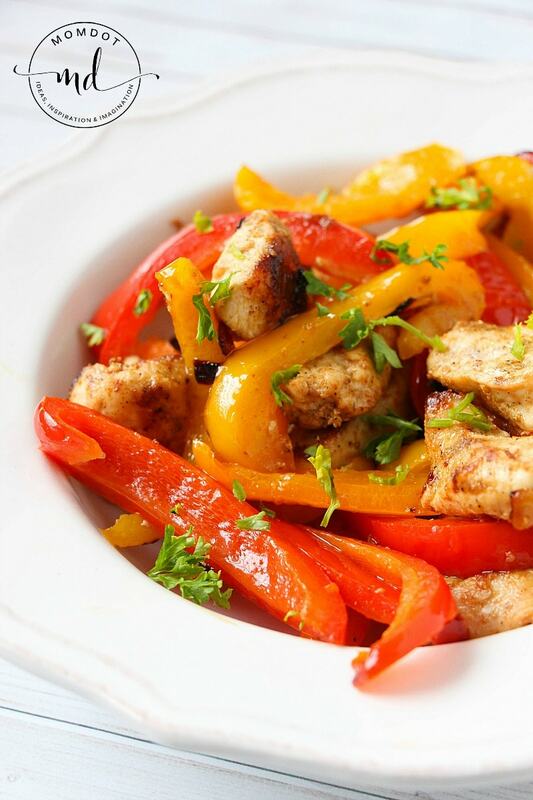 Created in under 20 minutes, perfectly seasoned chickens pair well with fresh veggies for a simple chicken fajita recipe everyone will love. And when eaten without shells, becomes carb free and 21 day fix approved. I love an easy dinner night and these simple chicken fajitas do not disappoint! Personally I like to throw my chicken and veggies in a bowl for dinner, but my kids still enjoy loading it up in a shell. Either way, the seasonings and slight crunch of the veggies make it a perfect quick dinner. If you are looking for another delicious chicken and veggie dinner, do not leave before saving this Grilled BBQ Foil Packet Chicken Recipe as well. No clean up! Of course these simple chicken fajitas are also 21 day fix approved but if you want something flavorful and are not watching what you eat, my favorite is this copycat olive garden Parmesan crusted chicken. Either way, dinner is ON! First prep your food. For me, this is always the longest part. Slice all your peppers into strips and cut up smaller pieces of onions, which of course make beautiful fajitas! Make sure you have a variety of pepper colors, which provide not only a beautiful fajita but a great flavor. Now let’s make the seasonings! Add your paprika, onion powder, pepper, salt, chili powder, paprika, salt and pepper. Now add 1 tablespoon of olive oil and 1/2 tablespoon of lime juice into mixture and stir. Pour your seasonings into a zip baggie and add your strips of chicken. Make sure all your strips are covered and let marinate. Add 1-2 tablespoons of olive oil in a cast iron pan and let warm to medium. Place your marinated chicken into the pan and let cook. Make sure you rotate your chicken and cook all the way through. Once done, pull from pan and place on plate. Now add another 1 tablespoon of olive oil to pan. Add in your sliced peppers and onions for approximation 3 minutes. Now put your chicken back into pan and stir to combine both chicken and veggies. Pull from heat. You can keep this carb free and 21 day fix dinner approved by serving in a bowl or feel free to add to a soft shell if you prefer. Sprinkle with fresh cilantro for color and taste. Simple chicken fajitas are just the dinner recipe your family ordered! 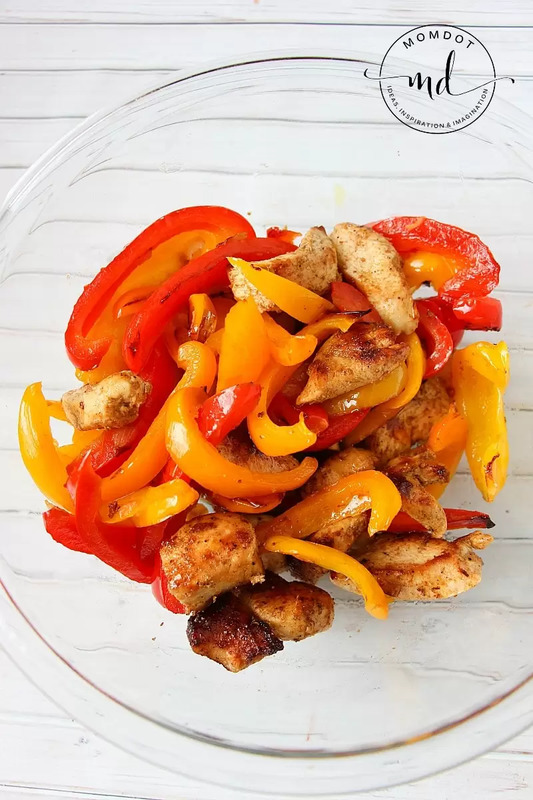 Created in under 20 minutes, perfectly seasoned chickens pair well with fresh veggies for a simple chicken fajita recipe everyone will love. And when eaten without shells, becomes carb free and 21 day fix approved. First prep your food. For me, this is always the longest part. Slice all your peppers into strips and cut up smaller pieces of onions. Make sure you have a variety of pepper colors, which provide not only a beautiful fajita but a great flavor. Now let's make the seasonings! Add your paprika, onion powder, pepper, salt, chili powder, paprika, salt and pepper. Stir. Now add 1 tablespoon of olive oil and 1/2 tablespoon of lime juice into mixture and stir. Pour your seasonings into a zip baggie and add your strips of chicken. Make sure all your strips are covered and let marinate. Add 1-2 tablespoons of olive oil in a cast iron pan and let warm to medium. Place your marinated chicken into the pan and let cook. Make sure you rotate your chicken and cook all the way through. Once done, pull from pan and place on plate. Cover with foil to keep warm. Now add another 1 tablespoon of olive oil to pan. Add in your sliced peppers and onions for approximation 3 minutes. Now put your chicken back into pan and stir to combine both chicken and veggies. Pull from heat. You can keep this carb free by serving in a bowl or feel free to add to a soft shell if you prefer. Sprinkle with fresh cilantro for color and taste.